Kellogg's (also Kellogg, Kellogg Company and Kellogg's of Battle Creek) is an American multinational food manufacturing company headquartered in Battle Creek, Michigan, United States. 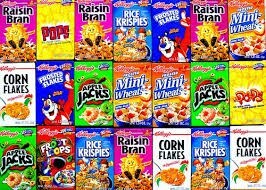 Kellogg's produces cereal and convenience foods, including cookies, crackers, toaster pastries, cereal bars, fruit-flavored snacks, frozen waffles, and vegetarian foods. The company's brands include Fruit Loops, Corn Flakes, Frosted Flakes, Rice Krispies, Special K, Cocoa Krispies, Keebler, Pringles, Pop-Tarts, Kashi, Cheez-It, Eggo, Nutri-Grain, Morningstar Farms, and many more. Kellogg's stated purpose is "Nourishing families so they can flourish and thrive."